In acid tropical forest soils (pH <5.5) increased mobility of aluminum might limit aboveground productivity. Therefore, we evaluated Al phytotoxicity of three native tree species of tropical montane forests in southern Ecuador. An hydroponic dose-response experiment was conducted. Seedlings of Cedrela odorata L., Heliocarpus americanus L., and Tabebuia chrysantha (Jacq.) G. Nicholson were treated with 0, 300, 600, 1200, and 2400 μ M Al and an organic layer leachate. Dose-response curves were generated for root and shoot morphologic properties to determine effective concentrations (EC). Shoot biomass and healthy leaf area decreased by 44 % to 83 % at 2400 μ M Al, root biomass did not respond (C. odorata), declined by 51 % (H. americanus), or was stimulated at low Al concentrations of 300 μ M (T. chrysantha). EC10 (i.e. reduction by 10 %) values of Al for total biomass were 315 μ M (C. odorata), 219 μ M (H. americanus), and 368 μ M (T. chrysantha). Helicarpus americanus, a fast growing pioneer tree species, was most sensitive to Al toxicity. 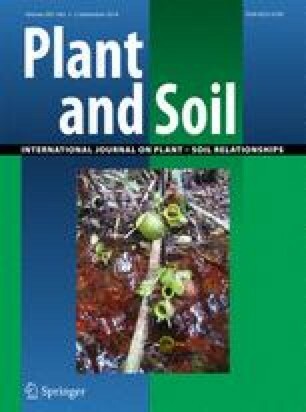 Negative effects were strongest if plants grew in organic layer leachate, indicating limitation of plant growth by nutrient scarcity rather than Al toxicity. Al toxicity occurred at Al concentrations far above those in native organic layer leachate. We thank Karoline Klaus, Katharina Kitzinger, Jose Luis Peña Caivinagua, and Orly Mendoza Aguirre for support in set up of the experiment, Rainer Rees Mertins and Bernd Felderer, ETH Zurich, CH, for support with WinRhizo, Nature and Culture International in Loja, EC, for providing the study area and the research station, Ecuadorian authorities for the research permit, and the German Research Foundation (DFG) for funding (FOR 816, Wi 1601/8-2).